The Saw of Cartagena, rich in minerals of lead and other metals they were exploited from the time of the Iberians until the middle of the XXth century. In the year 1874 was inaugurated the "Streetcar to steam of Cartagena to Iron-works", which was communicating the city and the port of Cartagena with the center of the mining activities. This small railroad was prolonged later up to "La Union" and to "Los Blancos". Exploited with British locomotives of steam (The promoters and initial owners of the line were English), in the year 1960 material diesel started coming. These years this railway net already belonged to the State. The Railroad exploitation for the State (EFE firstly) and Narrow gauge railroads (FEVE) later they were, and they are nowadays the owners of this railroad. Non-existent today in day the mining traffic, the travelers' suburban transport is the domineering activity in this small railroad. 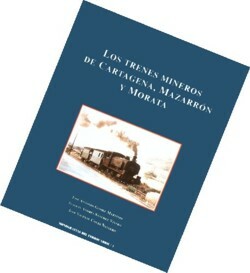 This book describes the history of this known little railroad, besides other mining lines, even worse known: Railroads of the Saw of Cartagena and of the murcian littoral (F.C. of Mazarrón and Morata's F.C.). Authors: José Antonio Gómez, José Vicente Coves, Joaquín Sánchez. Size: 19 X 24 X 1 cm.